Chandra observations indicate the two brightest stars in Alpha Centauri are not pummeling any orbiting planets with large amounts of X-rays. Alpha Centauri is a triple star system that is only about 25 trillion miles from Earth, and contains the closest star to our Sun. Two of the three stars in Alpha Centauri closely resemble the Sun, making it a prime target in the search for life-hosting exoplanets. Chandra has monitored the Alpha Centauri system every six months for over a decade, providing valuable information about its stars. A new study involving long-term monitoring of Alpha Centauri by NASA's Chandra X-ray Observatory indicates that any planets orbiting the two brightest stars are likely not being pummeled by large amounts of X-ray radiation from their host stars, as described in our press release. This is important for the viability of life in the nearest star system outside the Solar System. Chandra data from May 2nd, 2017 are seen in the pull-out, which is shown in context of a visible-light image taken from the ground of the Alpha Centauri system and its surroundings. 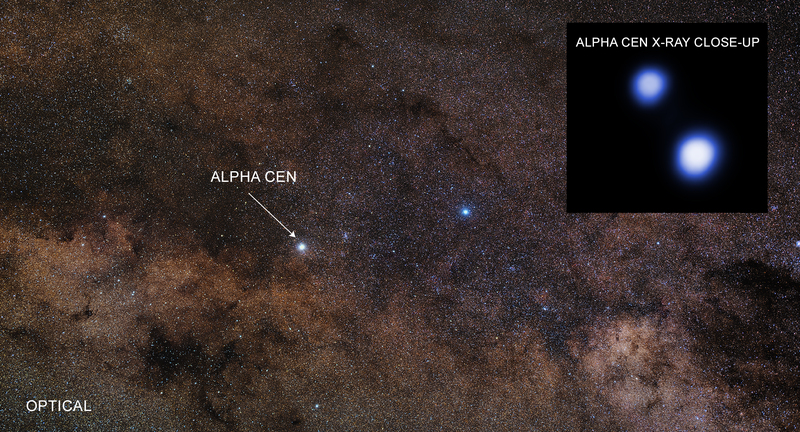 Alpha Centauri is a triple star system located just over four light years, or about 25 trillion miles, from Earth. While this is a large distance in terrestrial terms, it is three times closer than the next nearest Sun-like star. The stars in the Alpha Centauri system include a pair called "A" and "B," (AB for short) which orbit relatively close to each other. Alpha Cen A is a near twin of our Sun in almost every way, including age, while Alpha Cen B is somewhat smaller and dimmer but still quite similar to the Sun. The third member, Alpha Cen C (also known as Proxima), is a much smaller red dwarf star that travels around the AB pair in a much larger orbit that takes it more than 10 thousand times farther from the AB pair than the Earth-Sun distance. Proxima currently holds the title of the nearest star to Earth, although AB is a very close second. The Chandra data reveal that the prospects for life in terms of current X-ray bombardment are actually better around Alpha Cen A than for the Sun, and Alpha Cen B fares only slightly worse. Proxima, on the other hand, is a type of active red dwarf star known to frequently send out dangerous flares of X-ray radiation, and is likely hostile to life. Planets in the habitable zone around Proxima receive an average dose of X-rays about 500 times larger than the Earth, and 50,000 times larger during a big flare. This movie shows Chandra observations of Alpha Centauri A and B taken about every 6 months between 2005 and 2018. Alpha Cen A is the star to the upper left. The motion of the pair from left to right is their "proper motion", showing the movement of the pair in our galaxy with respect to the solar system. The change in relative positions of the pair shows the motion in their 80 year long orbit and the wobbles show the small apparent motion (called parallax) caused by the year long orbit of the Earth around the Sun. The Chandra images are shown in black and white. 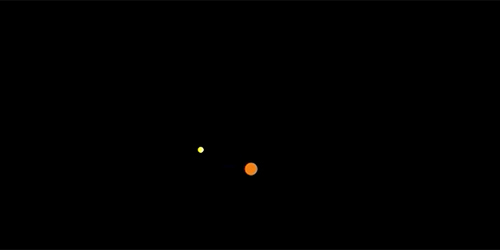 To place these semi-annual images in context, the two colored circles show the expected motion of Alpha Cen A (yellow) and Alpha Cen B (orange) when taking account of proper motion, orbital motion and parallax. The size of the circles is proportional to the X-ray brightness of the source. Tom Ayres of the University of Colorado at Boulder presented these results at the 232rd meeting of the American Astronomical Society meeting in Denver, Colorado, and some of these results were published in January 2018 in the Research Notes of the American Astronomical Society. NASA's Marshall Space Flight Center in Huntsville, Alabama, manages the Chandra program for NASA's Science Mission Directorate in Washington. The Smithsonian Astrophysical Observatory in Cambridge, Massachusetts, controls Chandra's science and flight operations. Coordinates (J2000) RA 14h 39m 37s | Dec -60° 50´ 2"
Alpha Centauri: a triple star system that contains the closest star to our Sun. About 4.2 light years from Earth. X-rays from the Chandra X-ray Observatory and optical light from ground-based telescope. About 2.3 billion kilometers across.